So what is a hand lens? What type of lens should you buy? And how do you use it? Well, a hand lens is exactly what the name says, it is a magnifying lens which is hand-held. 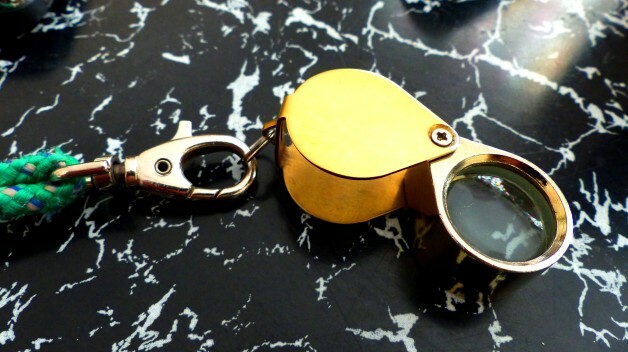 It is sometimes called a jeweller’s loupe because jewellers use them to read gold and silver hall marks and to examine precious gem stones, also used by watchmakers and stamp and coin collectors, while geologists also use them for examining the crystals in rocks etc. Of course botanists use them pretty much all the time for examining plants and especially for looking at the details of leaves, stems and flowers for important ID characters which are difficult to see with the naked eye. Price can be a good guide, a cheap (i.e. 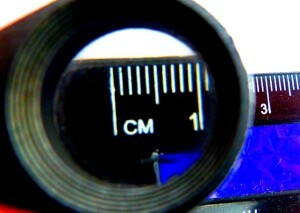 less than £10) x20 lens is very unlikely to be a true x20, but the only sure fire way is to check the lens yourself. So, do you need x10 or x20? For vascular plant ID a good quality x10 is enough, though the emphasis is on a “good quality” don’t be fooled by advertisements for cheap x10 lenses they will often be barely more than x3 or x5 in reality and will not usually do the job. If you are working on lower plants – mosses for example – the whole plant can be tiny maybe just a few mm and the leaves obviously even tinier, so a good x20 lens can be really helpful for deciding e.g. if the often minute moss leaves have a nerve or if the leaf has a border of different cells. The serious bryologist will confirm moss ID in the lab with a microscope, but for moss ID in the field in addition to your standard x10 lens a x20 lens can be really valuable. 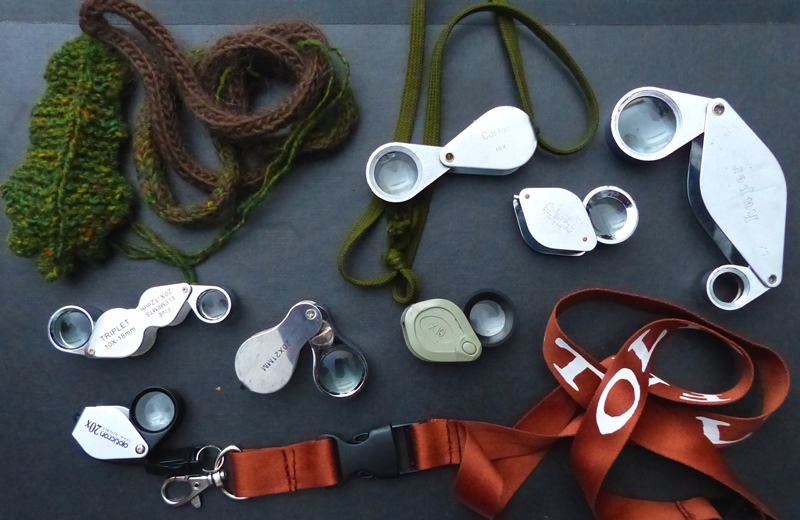 Some hand lenses come with their own built in lamp so you can illuminate the subject, this is great in low light conditions, for woodland mosses for example and on dull days. Dr M doesn’t use this himself but colleagues do and speak very highly of them! One other practical point, look in the mirror, have you got a screw loose? This is not an insult but a common fact of many hand lenses, the screw which holds the lens to the lens holder often works loose and can detach and get lost. Dr M keeps a small screw driver to hand to tighten this, alternatively apply some superglue to the fixing to prevent this from happening. And finally, where to purchase? This is up to you and the size of your wallet. Here are a few suggestions from a vast array of hand lenses and companies on the web. Google “hand lens” and “jewellers loupe” and be overwhelmed by the result! If you have special favourites please contact Dr M and tell him all about it. Is there such a thing as a x30 lens and what would you use it for? Karen hello and yes there is such a thing as a x30 lens but a real x30 will be a such a thick lens with very narrow diameter it is difficult to get enough light on the subject to use in the field. Also you rarely need x30 magnification in the field and if you do you need to take the object home and use a micrioscope. A good x10 is suitable for most botany! Is it best to keep my reading glasses on when using a x10 botany field lens, or change to a x20 without glasses? Can you tell me what is best for viewing the internal parts of wild flowers. Everything I have x10, x15 and x20 doesn’t do the job. I am currently debating whether a 10×12 or a 10×20 lens would be better. Does the diameter make a difference in viewing the plants, or is it just up to personal preference? They don’t have a particular manufacturer I believe but seem quite good. Thank you very much Dr M. Your advice helped me a lot..